Has 4 exercise functions for Leg, Arm, Hand Exercise & adjustable seat and a dual action console. 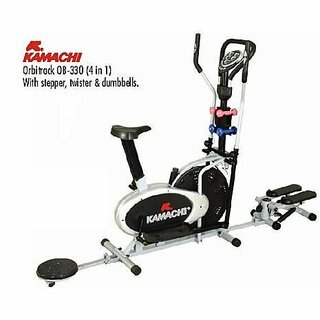 Kamachi Elliptical Bike OB-330 (4IN1) Has 4 exercise functions for Leg, Arm, Hand Exercise & adjustable seat and a dual action console. Home Use Exercise Bike.Meter Showing Time, Distance, Speed, Calories & Hand Pulse. Dual Action Hand Bars + Extra Stationary Handle. Dumbbells SetTwister, Stepper, Cycling, Rowing Twister And Stepper Foldable. Adjustable Seat Magnetic Tension Controller. Body Toner. To Recieve updates and possible rewards for Kamachi OB-330 please sign in. To Recieve updates and possible rewards for Cross Trainer/Elliptical please sign in.